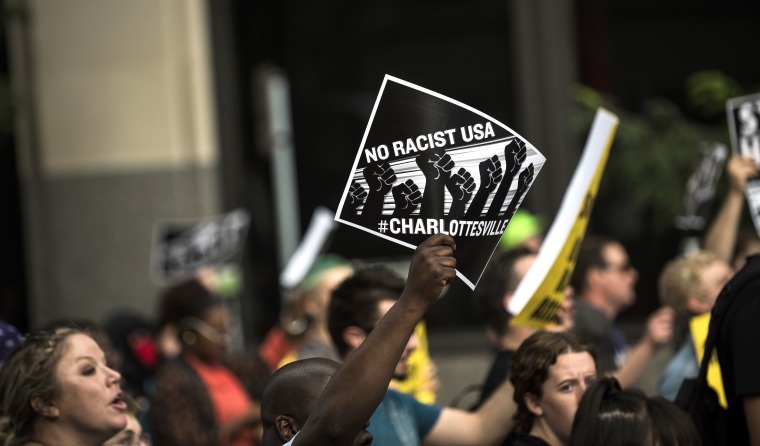 Journalists should avoid using euphemisms like "racially charged," the stylebook said. If it is racist, call it racist, says the Associated Press Stylebook in a change to guidelines announced Friday. The AP Stylebook, a manual widely used by journalists at many news outlets, including NBC News Digital, has changed its entry on race, advising reporters and editors against the use of ambiguous terms such as "racially charged" and "racially motivated" to describe incidents that display racial bias, the Poynter Institute reported. "The terms racism and racist can be used in broad references or in quotations to describe the hatred of a race, or assertion of the superiority of one race over others," the AP states in the new guideline announced at a national conference of ACES: The Society of Editing in Providence, Rhode Island, on Friday. The new entry on race encourages journalists to assess the facts of a situation and to "think broadly about racial issues before having to make decisions on specific situations and stories." The NAACP, the nation's oldest African-American civil rights organization, applauded the change as a "move in the right direction," spokesperson Malik Russell said in an email to NBC News. "In the face of a rising tide of white supremacy, embraced by some of our nation's leading political and corporate figures, it's important more than ever before to call out both racism and racists," Russell said. Euphemisms like "racially charged" have made their way into news stories and headlines in recent coverage such as the alleged attack on "Empire" actor Jussie Smollett, the controversy over a confrontation in Washington between Covington Catholic High School students and a Native American elder, and in news about Rep. Steve King, R-Iowa, defending white supremacy. The president of the National Association of Black Journalists, the largest organization of African-American media professionals, told NBC News in an email that the change in AP guidelines shows "we have progress to make when dealing with race and racism in this country and in our newsrooms." "Previous years of soft-pedaling around the word 'racist' in news reporting are reflective of how we as a country have soft-pedaled around having an honest dialogue about the impact of racism not only in America but in American newsrooms," said Sarah Glover, NABJ president, who is also a social media editor at NBC-owned television stations. "I am hopeful that the recommendations by the AP will encourage us to be more direct and open about the impact of racism." Russell at the NAACP said he encourages news outlets to ensure diversity among their staff to help facilitate conversations on race and racism. "You can't have real discussions on racism without a diverse workforce or diversity in senior-level and managerial positions," he said. "We can imagine how companies who lack true diversity and African American leadership often allow racist products or actions to occur simply because of a lack of diversity in the decisionmaking process."